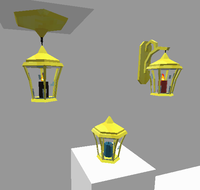 Fancy Lantern is a decorative light added by the BiblioCraft mod. It is rendered with a different fixture design depending on whether the player places it on the ceiling, floor or a wall. To change the colour of the candle inside, just put a lantern in a crafting table with a piece of dye. Fancy Lantern has no known uses in crafting. This page was last modified on 22 February 2018, at 09:13.